The fifth and last day of joint staff training event is dedicated to group-work sessions in which participants debate to highlight the main topics which has been learnt during the previous four days, to evaluate the training process and define the eventual improvements and adjustments. The participants were divided into 3 groups taken as single partnership; each group has a dedicated time to develop a practical project ideas, to define the shape and roles within the partnership-group, and to distribute the relative responsibilities and tasks. Each group mandate is to debate and address the aims and objectives; to identify the activities and sub activities on the basis of a problem tree, and its related solution tree. This exercise leads to the definition of draft project template. 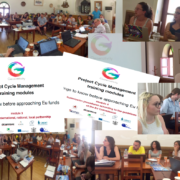 The group-work outputs has then been discussed on a plenary session where all participants share the lessons-learnt, and contribute with practical tips and suggestions on the basis of their competences and experiences. Day 4 is dedicated to familiarize with PCM issues related to the implementation of a project proposal. The module 5 focuses on implementation, dissemination, valorization and communicative strategies. All these terms related to concepts which have precise meanings and logical implication within the framework of the development of an effective and sustainable project. The module also enlightens the procedures for the administrative and financial management; to the overview of the eligibility criteria of the cost items for the construction of the estimated budget, with attention to the differences between direct costs, indirect costs, other costs and subcontracting rules. Attention has been dedicated to the indication on how to navigate between the different forms of financing. 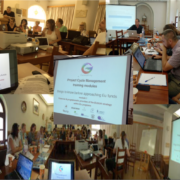 The training day closes on tools for monitoring and evaluate the process, the activities and the results. http://generativity.eu/wp-content/uploads/2017/06/201706-generativity-day-4-pic.png 797 1062 19.coop t http://generativity.eu/wp-content/uploads/2016/12/small_logo-180x180.jpg 19.coop t2017-09-01 14:07:142017-09-01 14:07:14Generativity LTTA in Syros - day 4: "Implementation, evaluation, valorisation, dissemination, exploitation of project results"
Day 3 is dedicated to the deepening of the module 3 and module 4. 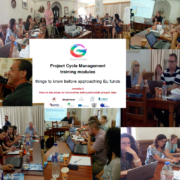 The issues at stake in module 3 allow participant to focus on the following themes of Project Cycle Management: the differences between implementation, transfer of innovation and mainstreaming; things to consider when building the transnational dimension: the geographical balance, homogeneous entities, the allocation of responsibilities & operational management; the very central communication and collaboration aspect, with the related suggested ICT available tool. The module 4 is dedicated to the learning specifically dedicated to the submitting process, with focuses on the variety of forms and attachments, and the required documents to be prepared. Similarly to other days, the participants alternate given lessons on the major aspects from the chairing experts, with roundtable debate with productive answers-to-questions dynamics. http://generativity.eu/wp-content/uploads/2017/06/201706-generativity-day-3-pic.png 791 1059 19.coop t http://generativity.eu/wp-content/uploads/2016/12/small_logo-180x180.jpg 19.coop t2017-09-01 14:05:492017-09-01 14:05:49Generativity LTTA in Syros - day 3: "Building an international, national, local partnership" and "Submission procedures according to the guidelines of the European Commission"
All partners meet for the day 2 of the LTTA training event in Syros, a whole working day dedicate to learn the lessons on how to structure an innovative and sustainable idea. The training focuses on major principles of Project Cycle Management related to the structuring procedures that allow organizations to pass from a project idea to its development into a formal project proposal. The training program leads participants to familiarize to concept such as the analysis of the logical structure of the project intervention; the project cycle management general references; the process to pass from the need analysis to design of the SWOT matrix; the design of the objectives under the SMART matrix and their development into the logical framework to foster an innovative, sustainable, effective project idea. Participants alternate moment of direct training with roundtable confrontation and share that allow to close the day 2 with feedback that will be further developed to maximize the training offer itself. http://generativity.eu/wp-content/uploads/2017/06/201706-generativity-day-2-pic.png 790 1054 19.coop t http://generativity.eu/wp-content/uploads/2016/12/small_logo-180x180.jpg 19.coop t2017-09-01 14:04:082017-09-01 14:04:08Generativity LTTA in Syros - day 2: "How to structure an innovative and sustainable project idea"
the LTTA short term staff training event started successfully today in Syros, where partners congregate and started the working program with the testing of the module 1 of the training set on Project Cycle Management. The module 1 is focused on giving an overview on the financial and programmatic priorities of the EU2020 strategy within various programs. Some main thematic areas have been discussed, such as the areas and priorities for the 7 years mandate of the EU2020 strategy; the structural funds and of the funds for direct delivery; an overview of the matrix of opportunities available in the 2014-2020 program, with specific attention to the social dimension. 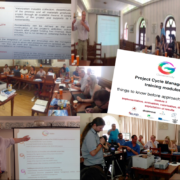 All partners contribute to the debate, bringing and sharing their specific expertise, and fixing feedback, updates and amendments that will contribute to improve the effectiveness of the first module of the training on PCM. 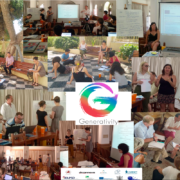 http://generativity.eu/wp-content/uploads/2017/06/201706-generativity-day-1-pic.png 503 640 19.coop t http://generativity.eu/wp-content/uploads/2016/12/small_logo-180x180.jpg 19.coop t2017-09-01 14:00:502017-09-01 14:00:50Generativity LTTA in Syros - day 1: "overview on the financial and programmatic priorities of the EU2020 strategy"